While every renovation is unique, most home remodeling experts agree that bathroom remodeling projects tend to be more multifaceted per-square-foot than almost any other kind of remodeling project. As such, many homeowners opt to hire a professional bathroom remodeling company to handle all aspects of their bathroom renovation project. Some jobs necessitate moving walls; some do not. Ultimately, your project’s requirements determine which steps you need to take, and in which particular order. The first phase of any luxury bathroom remodel is planning; lots and lots of planning. If you are working with a remodeling contractor, it is important to get both time and budget estimates before you dive in too deep. For example, if you want to change the overall layout of your bathroom, it is best to develop your new floor plan at this stage of the process. To determine exactly how long your bathroom remodel will take depends on the scope and size of the project. 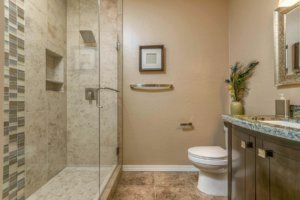 At Republic West Remodeling, after we meet with you to discuss your plans, we always provide an estimated bathroom remodel timeline. We make it a priority to stick to the timeline and keep your project moving according to schedule. Many people consider demolition the “exciting part” of the bathroom remodeling process, but it is not something that homeowners should jump into without a smart game plan. Depending on the extent of the work, this step can involve replacing a few fixtures or taking the entire bathroom down to the studs. It is important to understand that the removal of wallboard and fixtures brings a clear picture of what is going on “behind” your walls. With luck, everything will be dry. However, if there is evidence of water or mold damage, this stage is an ideal time to take care of such repairs to ensure a trouble-free bathroom down the road. We suggest never skimping when it comes to water issues. It is critical to spend the money at this stage to fix any potential plumbing, electrical, or structural issues. If you are moving any bathroom fixtures around as part of your new layout, you will need to install the new plumbing in advance. Establish a plan with your bathroom remodeling contractor about where each component will reside, including locations for the sink, toilet, and shower. If you need to replace old, worn-out piping in your bathroom, this is a good time to check this task off on the list, too. If you are getting rid of an old bathtub or shower pan during your bathroom remodel project, we suggest installing the new one at this time. However, if your bathtub or shower pan is still structurally sound, you can also get them refinished, versus replacing them. If you are having new floor tile installed, a contractor will secure the tiles with spacers to the subfloor, to create room for grout. The tile needs to be left alone for 24 hours, and then your contractor will put grout in the empty spaces. The grout needs another 24 hours to dry before you can clean the floors. Depending on how your space is set-up, you can ask your contractor if they can install your wall tile and floor tile in the same phase. Installing wall tile is basically the same process as floor tile; 24 hours for the tiles to set, then 24 more hours for the grout to dry. If your bathroom remodeling contractor has removed any tile from your bathroom walls, it is possible that you will need to replace some of the drywall. A contractor can use cement board in place of drywall behind tile in the wet areas your bathroom. Once the wall is completely dry, you can paint over it or re-tile it. Choose a semi-gloss paint, so it is easy to clean. If your home is older, you will most likely need a professional electrician to install the appropriate outlet box for the vanity light. You may also want to replace your vanity and sink. In some cases, additional plumbing pieces are necessary during this step of the process to make old plumbing work with a new fixture. If you have purchased a new faucet and sink drain, most contractors will install them when setting up your new vanity. We also suggest replacing any knobs and other features in your bathtub and shower area at this stage. Choose complementary finishes on all of the faucets to keep the space bathroom aesthetically cohesive. Some of the final steps in a typical bathroom remodel timeline involve installing the baseboards and door trim. If you need your contractor to paint these pieces, they can do it either before or after installation. One of the last stages of a bathroom renovation is installing any accessories, such as mirrors, shelves, towel bars, and toilet paper holders. These features are relatively quick and easy to install. Renovating any room in your home can be a massive undertaking, especially the bathroom. Our team of designers and builders can transform your bathtub, shower, tile, sink, and countertops into the luxury bathroom space you have always dreamed about and wanted. Contact Republic West Remodeling today to schedule your free luxury bathroom design consultation, or download our latest bathroom guide, “Stunning Bathroom Remodeling: From Concept to Completion” to learn more about the bathroom remodeling process!